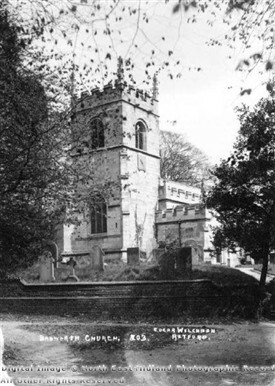 "In 1295, the advowson of this church was the property of Robert de Swillington, who had free warren in Babworth, and at his death, in 1365, it descended to Sir Thomas de Grendon, who, shortly afterwards sold it to Sir William Trussbutt, and his heirs, but who, within three years after taking possession, presented it to the priory of Newstead, having first obtained the king's license, and the license of Sir Thomas de Saundby, chief and mesne lord thereof, to do so. "From this period until 1531, it remained in the possession of the said priory, when John Blake, the then prior, on the 4th of October in that year, for the sum of fifteen pounds, granted it, and one acre of land, to John Hercy, Esq. of Grove, and to his heirs; nevertheless, it appears that he only made one presentation, when it passed into other hands, and in 1674 became the property of the Wortleys, from whom it was purchased by John Simpson, Esq. in whose descendants the patronage is continued. "The church, which is dedicated to All Saints, is a small but handsome structure of stone, advantageously situated on a rising ground. 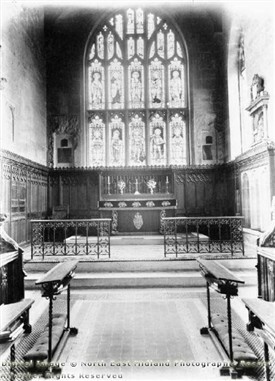 It consists of tower steeple, with three bells, and clock, a nave and chancel uniform in their windows, height, and battlements, with a side aisle and vestry, and a handsome porch. "The whole is of the later period of the Gothic architecture. The little burial plot which surrounds it, is considerably elevated, being connected with, or rather enclosed within the elegant pleasure grounds of the adjacent buildings; while the fine trees, aged and bowery, enhance materially the charming effect of the ivy-mantled tower".